One of the major functions of the N-formyl peptide receptor (FPR) is to mediate leukocyte degranulation. Phosphorylation of the C-terminal domain of the FPR is required for receptor internalization and desensitization. Although arrestins mediate phosphorylation-dependent desensitization, internalization, and initiation of novel signaling cascades for a number of G protein-coupled receptors, their roles in FPR regulation and signaling remain unclear. CXCR1-mediated degranulation of RBL-2H3 cells is promoted by arrestin binding. To determine whether receptor phosphorylation or arrestin binding is required to promote FPR-mediated degranulation, we used RBL-2H3 cells stably transfected with either the wild-type FPR or a mutant form, ΔST, which is incapable of undergoing ligand-stimulated phosphorylation. We observed that stimulation of wild-type FPR resulted in very low levels of degranulation compared with that mediated by cross-linking of the FcεRI receptor. Stimulation of the ΔST mutant, however, resulted in levels of degranulation comparable to those of the FcεRI receptor, demonstrating that neither receptor phosphorylation nor arrestin binding was necessary to initiate FPR-mediated degranulation. 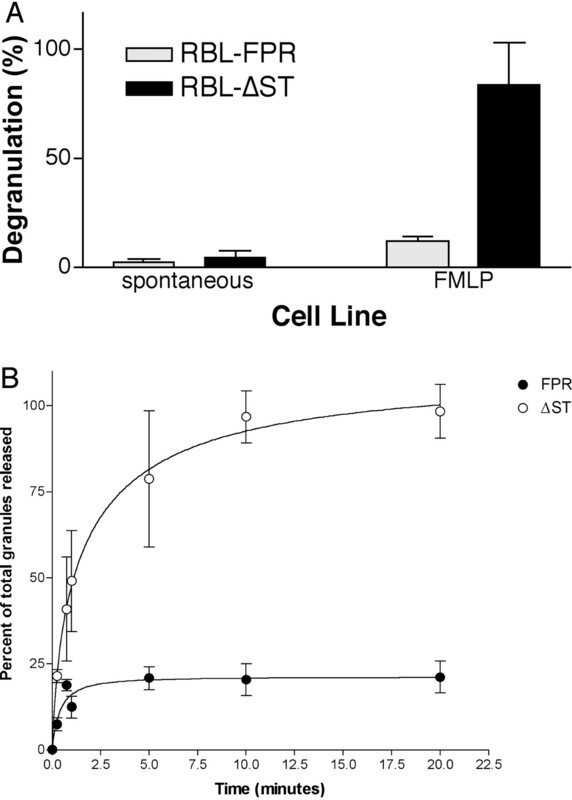 Degranulation initiated by the ΔST mutant was proportional to the level of active cell surface receptor, suggesting that either receptor internalization or desensitization may be responsible for terminating degranulation of the wild-type FPR. To distinguish between these possibilities, we used a partially phosphorylation-deficient mutant of the FPR that can undergo internalization, but not desensitization. Degranulation by this mutant FPR was indistinguishable from that of the ΔST mutant, indicating that FPR phosphorylation or binding of arrestin but not internalization terminates the degranulation response. The formyl peptide receptor (FPR)3 belongs to a diverse family of seven-transmembrane receptors that activate host defense mechanisms in response to ligand binding. These defense mechanisms in the leukocyte include chemotaxis, superoxide production, and degranulation (1). The binding of agonists, such as fMLP, to the FPR leads to a conformational change in the receptor that mediates the exchange of GDP for GTP in the α subunit of a heterotrimeric G protein. In turn, the βγ subunit of the heterotrimeric G protein is released, and the downstream signaling events are initiated (2). Because of the potentially harmful effects of excessive superoxide production and degranulation, a fine balance between receptor activation, desensitization, and resensitization must be maintained, while allowing the cell to carry out its designated functions. Failure to do so can have deleterious effects, resulting in conditions such as reperfusion injury, atherosclerosis, and arthritis. The regulation of signaling events induced by ligand binding of a G protein-coupled receptor (GPCR) is mediated by phosphorylation of the receptor, which, in turn, leads to the binding of accessory proteins to the phosphorylated intracellular domain. One group of such accessory proteins is the arrestins. Arrestins are cytoplasmic proteins that were originally shown to be involved in the desensitization of numerous GPCRs, presumably through steric interference with G protein binding (2, 3). It was subsequently demonstrated that arrestins could bind directly to clathrin and AP-2, thereby mediating internalization of certain GPCRs (4, 5). Most recently, arrestins have been shown to serve as scaffolds for a number of kinases, including Src (and related kinases), mitogen-activated protein kinases, and Disheveled (6, 7, 8). In the case of FPR, however, arrestin binding has been shown not to be required for receptor internalization, with recent in vitro work suggesting that receptor phosphorylation alone may substantially inhibit G protein interactions (9, 10, 11). Overall, the role of arrestin in GPCR-mediated signaling remains ambiguous and seems to vary depending upon the GPCR. For example, arrestins induce degranulation via the IL-8R, CXCR1 (12), but are not required to mediate degranulation via the C3a receptor (13). Downstream cellular events, triggered by activation of the C3a receptor, however, such as monocyte chemoattractant protein 1 (MCP-1) production, are dependent on arrestin binding to the receptor (13). This interaction seems to be dependent upon phosphorylation of the C3a receptor and probably activation of arrestin, since stimulation of a phosphorylation-deficient mutant fails to induce MCP-1 production (13). Whether receptor phosphorylation or arrestin binding has a role in regulating the signaling events initiated by binding of agonist to the FPR remains unclear (9, 11). Although internalization of the FPR is an arrestin-independent process (10), arrestins colocalize with the FPR upon stimulation with fMLP. The pathways that result in FPR desensitization, however, are distinct from those involved in receptor internalization (14). The rat basophil leukemia cell line (RBL-2H3) provides a useful model to examine the regulation of signaling pathways that originate at the FPR. Stimulation of the FPR in RBL-2H3 cells transfected with the FPR has provided ambiguous results with respect to degranulation (15, 16). In addition, recent studies have reported conflicting data regarding the roles of receptor phosphorylation and accessory proteins in mediating degranulation initiated by binding of ligands to their cognate receptors (13, 17). To examine the role of receptor phosphorylation and arrestin in the regulation of signaling events that mediate the degranulation of RBL-2H3 cells upon stimulation of the FPR, we used a mutant of the FPR that lacks phosphorylation sites in the C terminus. In addition, using a second mutant that fails to bind arrestin, but is capable of internalization, we examined the consequence of receptor internalization on FPR-mediated signaling events in the absence of arrestin binding. We report that while degranulation of RBL cells in response to stimulation with the formyl peptide can be initiated in the absence of receptor phosphorylation and arrestin binding, receptor phosphorylation and/or arrestin binding lead to termination of FPR-mediated degranulation. FMLP was purchased from Sigma-Aldrich (St. Louis, MO). Hexapeptide (N-fNleLFNleYK), hexapeptide-FITC, and Alexa-633 were purchased from Sigma-Aldrich and Molecular Probes (Eugene, OR). RPMI 1640 medium was obtained from BioWhittaker (Walkersville, MD), and MEM was obtained from Invitrogen (San Diego, CA). DNP-specific IgE was a gift from Dr. J. Rivera (National Institutes of Health, Bethesda, MD). Anti-arrestin rabbit polyclonal serum that reacts with both arrestin-2 and arrestin-3 was provided by Dr. J. Benovic (Thomas Jefferson University, Philadelphia, PA). Texas Red-conjugated goat anti-rabbit was purchased from Jackson ImmunoResearch Laboratories (West Grove, PA). The cDNA encoding the FPR was obtained from a human HL-60 granulocyte library (18). The ΔST mutant in which all 11 of the serine and threonine residues have been replaced (S319A, T325G, S328A, T329A, T331A, S332G, T334G, T336G, S338G, T339A, S342G) and the ΔA mutant (S328A, T329A, T331A, S332G) have been described previously (19). RBL-2H3 cells were a gift from Dr. B. Wilson (University of New Mexico, Albuquerque, NM). Plasmid DNA was transfected into RBL-2H3 cells by a lipid-based (Effectene; Qiagen, Valencia, CA) method. Briefly, cells were plated overnight, transfected with 1 μg of plasmid DNA, and then selected for 8–12 days in G418. Surviving cells were pooled, and the expression levels were analyzed by flow cytometry of 10 nM N-fNleLFNleYK-FITC. RBL cell lines expressing three different levels of ΔST receptor were isolated by flow cytometry: RBL-ΔST (high; ∼200,000 receptors/cell), RBL-ΔST (mid; ∼100,000 receptors/cell), and RBL-ΔST (low; ∼10,000 receptors/cell). Receptor numbers were quantitated using Simply Cellular calibration beads (Bangs Laboratories, Fiskers, IN). RBL cell lines were maintained at 37°C in 5% CO2 in MEM-Earle’s medium with 15% heat-inactivated FBS, 2 mM l-glutamine, 100 U/ml penicillin, 0.1 mg/ml streptomycin, and 1 mg/ml G418. All degranulation assays were conducted in 1× HBSS containing 10 mM HEPES, 0.05% BSA, and 15 mM NaHCO3. Three days before assays, G418 was removed from the medium. For FcεR1 activation cells were incubated for at least 14 h with 1 μg/ml of DNP-specific IgE (anti-DNP IgE) to bind FcεR1, then rinsed, and Ag (100 ng/ml of DNP-BSA) was added to cross-link the IgE-FcεR1 complexes. FPR was activated with 100 nM fMLP. Degranulation assays were conducted at 37°C for 30 min. Supernatants containing β-hexosaminidase were incubated with p-nitrophenyl-N-acetic-3-d-glucosamide (Sigma-Aldrich) for 1 h at 37°C, neutralized with 200 mM glycine (pH 10.7), diluted in water, and read on a spectrofluorometer at 405 nm. Degranulation values were normalized to the degranulation values measured upon stimulation of the IgE receptor. Transfected RBL-2H3 cells were seeded onto glass coverslips and stimulated for 20 min with 10 nM fMLP at 37°C. The cells were fixed in 2% paraformaldehyde solution and permeabilized in 0.02% saponin in PBS. Cells were stained indirectly with anti-arrestin-2 rabbit polyclonal Ab. Confocal microscopy was conducted on a confocal microscope (Zeiss, New York, NY) using a 40× oil immersion objective. To understand the role of arrestin in the FPR-mediated signaling events that induce degranulation of RBL-2H3 cells, stable transfectants of wild type (RBL-FPR) or a phosphorylation-deficient mutant of the FPR, ΔST (RBL-ΔST), was generated. The ΔST mutant, which lacks all the potential phosphorylation sites found in the C terminus (serine and threonine residues) when expressed in U937 pro-monocytic cells, has previously been shown to mediate ligand-induced calcium fluxes, but not to undergo ligand-induced internalization or desensitization (14, 19). The expression of the receptors on the cell surface was confirmed by FACS detection of N-fNleLFNleYK-FITC, a fluorescent ligand that binds to the FPR. To facilitate comparisons between these cell lines, RBL-FPR and RBL-ΔST stable cell lines were sorted for expression levels of ∼100,000 receptors/cell (Fig. 1⇓A). 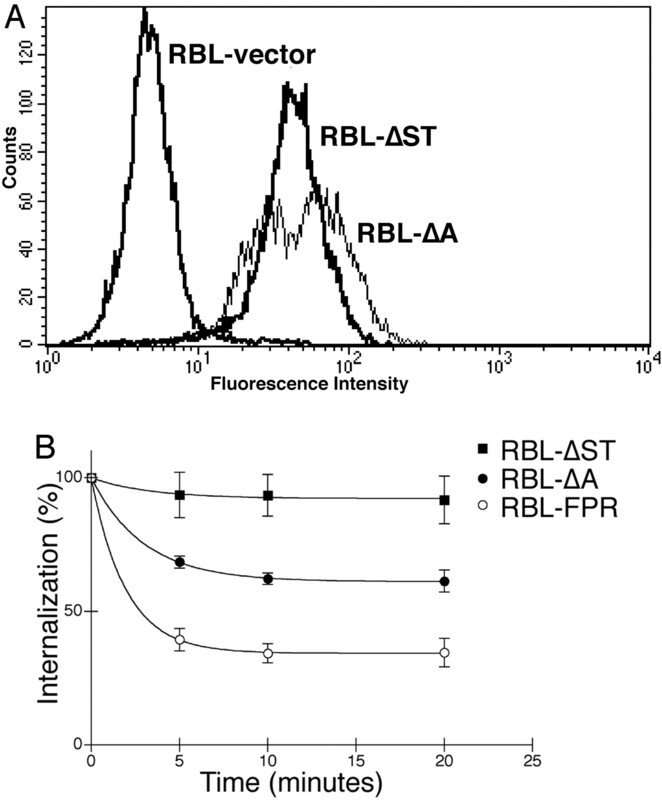 Characterization of RBL-FPR and RBL-ΔST cells. A, Analysis of expression of the FPR in pooled stable transfectants. RBL cells were stably transfected with the wild-type FPR or ΔST mutant. Control cells were stably transfected with the empty expression vector. To examine the level of expression of the receptor on the cell surface, cells were incubated with 10 nM fNlLFLYK-FITC on ice for 10 min and analyzed by flow cytometry. B, The ΔST mutant, which lacks phosphorylation sites in the C terminus, fails to internalize, while the wild-type FPR is capable of internalization. Transfectants were incubated in the presence of unlabeled 1 μM f-Met-Leu-Phe at 37°C for the 20 min, transferred to ice-cold PBS, washed to remove uninternalized peptide, and labeled with 10 nM FITC-6pep on ice for 10 min. The amount of receptor remaining on the cell surface was quantitated by flow cytometry. To confirm that the wild-type receptor could be internalized in RBL cells upon exposure to the formyl peptide, we incubated cells in the presence of 1 μM unlabeled fMLP for 20 min at 37°C and quantified the remaining cell surface receptors with N-fNleLFNleYK-FITC. While ∼70% of the wild-type receptors were internalized, the ΔST mutant failed to internalize (Fig. 1⇑B). These results confirmed that while the receptor levels were equivalent, the loss of phosphorylation sites in the C terminus resulted in a receptor that failed to internalize upon exposure to the agonist. Using the RBL-FPR and RBL-ΔST cell lines we examined whether the FPR-mediated degranulation of RBL-2H3 cells was activated by phosphorylation of FPR and subsequent arrestin binding. 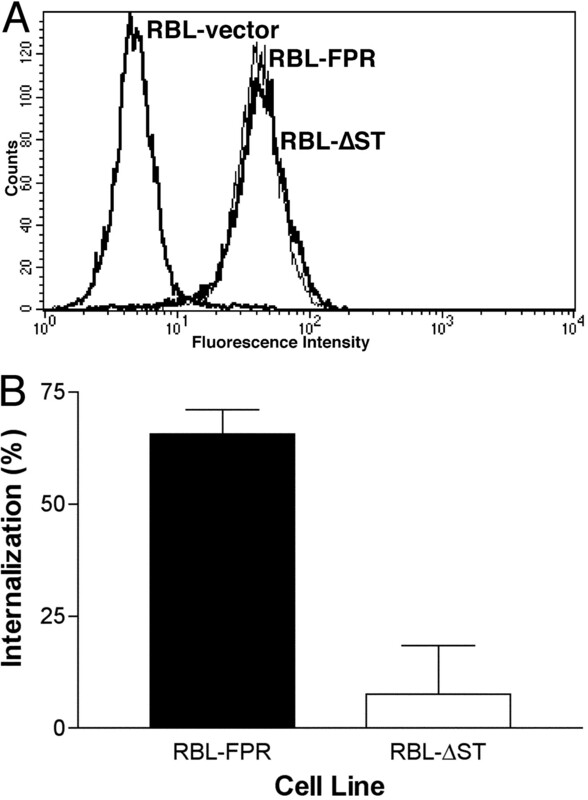 To this end we compared degranulation of the RBL-FPR cells to RBL-ΔST cells (Fig. 2⇓A). In response to a 30-min stimulation with 100 nM fMLP, RBL-FPR cells released 11.8 ± 2% of their available granules compared with IgE-mediated degranulation (Fig. 2⇓A). On the other hand, RBL-ΔST cells that lack phosphorylation sites in the C terminus and are incapable of interacting with arrestin released of 83.8 ± 19.4% of their granules. Phosphorylation is not required to induce FPR-mediated degranulation of RBL-2H3 cells. Stably transfected cells were plated overnight with or without DNP-specific IgE. The cells were stimulated with 100 nM f-Met-Leu-Phe or 100 ng/ml DNP-BSA for 30 min (A) or for times ranging from 15 s to 20 min (B). Supernatants were collected and analyzed for the release of β-hexosaminidase. Degranulation levels were normalized to IgE levels (n = 3). To determine whether the differences in magnitudes of degranulation were due to a difference in the rates of degranulation between RBL-FPR and RBLΔST cells, we examined the kinetics of the response (Fig. 2⇑B). The cells were incubated in the presence of 100 nM formyl peptide for the indicated times, and the supernatant was removed and assayed for the release of β-hexosaminidase. The t1/2 for RBL-FPR degranulation was ∼15 s. It is important to note that the attenuation of the degranulation response closely parallels the rate of FPR phosphorylation in RBL cells, which has a t1/2 of ∼1.5 min following FPR stimulation (16). In contrast, the t1/2 for RBL-ΔST was ∼ 1 min, with the release of granules approaching the maximum level of granules available in the cell by 5–10 min (Fig. 2⇑B). These results were unexpected, since it has been shown that RBL-2H3 degranulation mediated by the CXCR1 receptor requires arrestin activation by the receptor (17). In addition, the phosphorylation-deficient mutant of the C3a receptor exhibited an identical degranulation potential as the wild-type form of C3a (13). It was unclear, however, whether arrestin might be mobilized/activated in the ΔST mutant in response to stimulation with fMLP. To examine the behavior of arrestin upon stimulation of the FPR and ΔST receptors, two additional cell lines were generated, RBL-FPR-green fluorescent protein (GFP) and RBL-ΔST-GFP. In these cell lines the FPR was fused at the C terminus to GFP (20) and was used to determine whether activation of the receptor resulted in clustering of the arrestin. Stimulation of the RBL-FPR-GFP cell line with hexapeptide resulted in activation of the cells, as determined by spreading of the cells and generation of ruffles in the membrane. Although the FPR is phosphorylated in RBL cells within the first 2.5 min following receptor stimulation (16), clusters of FPR on the endosomes were difficult to detect at 2.5 min, and colocalization of arrestin with the GFP-FPR was only weakly visible at this time point (Fig. 3⇓A). The lack of a strong colocalization of arrestin with FPR at 2.5 min was not surprising, since arrestin is not required for internalization of the formyl peptide receptor and may only accumulate with the receptor on the endosomes following internalization. Strong colocalization of arrestin with FPR was observed at 20 min (Fig. 3⇓A). 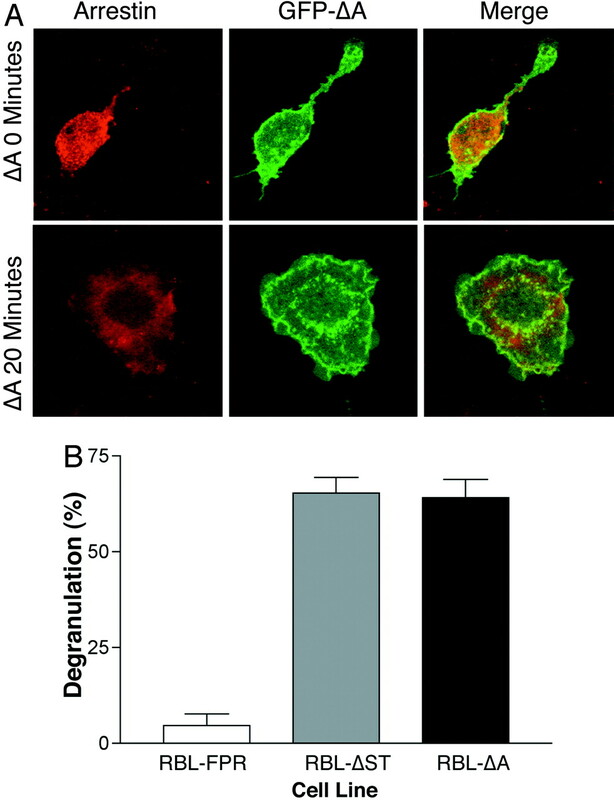 In contrast, while stimulation of the ΔST-GFP mutant with hexapeptide resulted in flattening and activation of the cells, as assessed by membrane ruffling and the mobilization of calcium, the arrestin failed to cluster. This observation suggested that while receptor-mediated activation of the cells induces degranulation, binding of arrestin is not required to generate the fMLP-initiated degranulation response in RBL-2H3 cells. A, ΔST receptor fails to colocalize with arrestin upon stimulation with the formyl peptide. Stably transfected cells were plated on glass coverslips overnight and fixed or were stimulated in the presence of 10 nM hexapeptide for 2.5 and 20 min (RBL-FPR) or 20 min (RBL-ΔST) at 37°C, then fixed in 2% paraformaldehyde. The cells were permeabilized in 0.2% saponin, incubated with the rabbit anti-arrestin as the primary Ab, and then labeled with secondary Texas Red-conjugated goat anti-rabbit Ab. Cells were visualized by scanning confocal microscopy. B, Formyl peptide stimulation of the RBL-ΔST and RBL-FPR cell lines results in mobilization of calcium. RBL cells were loaded with 5 μM Indo-1 AM in the presence of pluronic acid for 30 min in HBSS + Mg++, Ca++ pelleted, and resuspended in HBSS + Mg++, Ca++. The RBL cells were allowed to equilibrate on the spectrophotometer for 30 s and then were stimulated with 150 nM f-Met-Leu-Phe. The data shown are representative of three independent experiments. Cell spreading and ruffling, however, do not conclusively demonstrate activation of RBL cells in response to stimulation with formylated peptide. Therefore, we examined the ability of the cells to mobilize calcium in response to exposure to fMLP. To this end the cells were dissociated from the dishes, incubated with 5 μM Indo-AM and 0.005% pluronic acid, rinsed, and stimulated with formyl peptide. Both RBL-FPR and RBL-ΔST cells were capable of mobilizing calcium in response to 150 nm fMLP (Fig. 3⇑B) confirming that both cell lines were activated in response to stimulation with formylated peptide. Because the degranulation response of RBL-FPR cells, in which FPR is phosphorylated and can bind arrestin, is significantly different from that of RBL-ΔST cells, we reasoned that receptor phosphorylation and possibly arrestin binding may be involved in terminating the signaling events that result in degranulation. As mentioned, the wild-type FPR is internalized, and the ΔST mutant, which fails to become phosphorylated or bind to arrestin, remains on the surface of the RBL-2H3 cells following stimulation of the receptor. Therefore, it was unclear whether the number of active receptors remaining on the cell surface or the ability of the receptor to desensitize controlled the extent of the degranulation response. To determine whether the extent of the degranulation response could be controlled by the level of receptor on the surface of the cells, we generated two additional cell populations by FACS-based cell sorting, RBL-ΔST high (∼200,000 receptors/cell) and RBL-ΔST low (∼10,000 receptors/cell). Examination of these cell lines revealed that the degranulation response in RBL-2H3 cells generated by stimulating the nondesensitizing, noninternalizing FPR is related to the number of active receptors on the cell surface (Fig. 4⇓). Based on this observation, we predicted that the cells expressing the wild-type FPR at 100,000 receptors/cell should yield a minimal degranulation response of 25% based on the level of internalization observed at 30 min. The actual response should be even higher, since the initial signaling occurs at a level of 100,000 receptors/cell and only decreases over time as receptors are removed from the cell surface. It remained unclear, however, whether receptor internalization or inactivation attenuated the degranulation response of the RBL-FPR cells. To determine whether loss of cell surface receptors or a lack of receptor desensitization was responsible, we used a third cell line that is incapable of binding arrestin, but is capable of undergoing internalization. The receptor level on the cell surface correlates with the extent of degranulation. 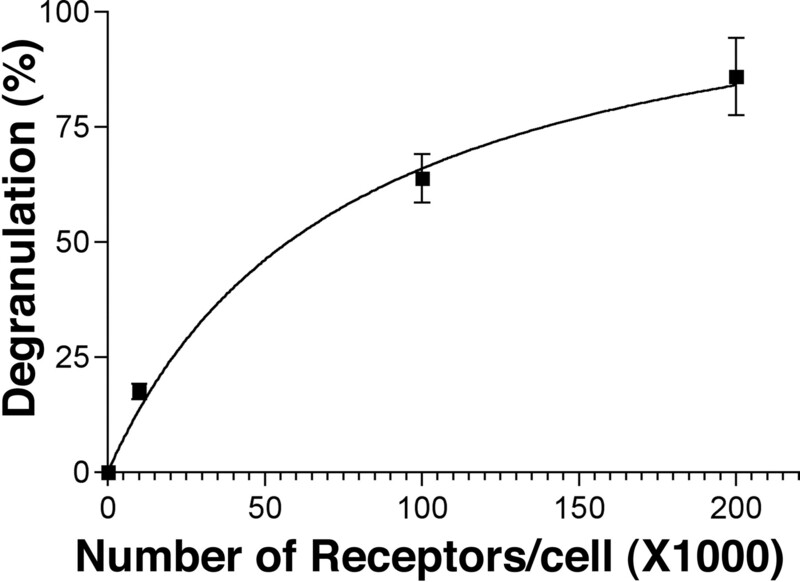 RBL-ΔST cells were sorted into three groups according to the level of FPR on the cell surface: RBL-ΔST-high (∼200,000 receptors/cell), RBL-ΔST (∼100,000 receptors/cell), and RBL-ΔST low (∼10,000 receptors/cell). The number of receptors was plotted against the degranulation level of each cell line. The RBL-ΔA (S328A, T329A, T331A, S332G) mutant lacks four of the 11 potential phosphorylation sites at the C terminus. This receptor, when expressed in the U937 pro-monocytic cell line, was able to internalize, but was only phosphorylated at 50% the level of the wild-type FPR (14). As a result, the ΔA receptor does not bind arrestin (19). In addition, using calcium mobilization assays, it was determined that the ΔA mutant, like the ΔST mutant, fails to desensitize in response to stimulation with the formyl peptide (14). We hypothesized that if phosphorylation of the C terminus and the subsequent association of arrestin attenuate FPR-mediated signaling events that lead to degranulation, then the ΔA mutant, which does not bind arrestin upon stimulation with fMLP, should degranulate to a similar extent as the ΔST mutant. If, however, the number of active receptors on the surface of the cell controls the extent of the degranulation response, then the response of the ΔA mutant should reflect the number of receptors on the cell surface that were not internalized, similar to the wild-type FPR response. RBL-ΔA (∼233,000 receptors/cell) and RBL-ΔST (∼100,000 receptors/cell) expression levels and internalization rates were compared (Fig. 5⇓). The rate of internalization of the ΔA mutant was the same as that of the wild-type FPR, although the overall extent of internalization of the ΔA mutant was ∼40% less than that of the FPR (Fig. 5⇓B). We predicted that if the number of active receptors on the cell surface controlled the level of degranulation, then the extent of degranulation exhibited by the ΔA mutant should be greater than the level exhibited by RBL-FPR. In contrast, since at the end of the signaling event, the ΔA mutant retains ∼120,000 receptors on the surface, the degranulation levels for the ΔA mutant should be equivalent to the level expected in the presence of ∼100,000 ΔST receptors. To determine whether the ΔA mutant was capable of activating the RBL-2H3 cells we examined the behavior of the cells in response to stimulation with fMLP (Fig. 6⇓). All three cell lines were stimulated in the presence of 100 nM fMLP. Although the ΔA mutant clustered and internalized in the presence of fMLP, the receptor failed to colocalize with arrestin (Fig. 6⇓). Activation of the ΔA receptor was also able to induce mobilization of Ca2+ (data not shown). The level of degranulation of the RBL-ΔA mutant was significantly greater than the level induced by stimulation of the FPR (Fig. 6⇓), but was not different from that of the ΔST mutant. From these observations we find that the lack of phosphorylation of the C terminus results in sustained FPR-mediated degranulation of RBL cells. We conclude that signals that are transduced from the wild-type FPR that result in degranulation are attenuated via phosphorylation of the receptor and possibly binding of arrestin to the FPR C terminus. RBL-ΔA mutant expression and internalization. A, Analysis of expression of the ΔA mutant receptor in pooled stable transfectants. RBL cells were stably transfected with ΔA mutant. RBL-ΔST and control cells are described in Fig. 1⇑. To examine the level of expression of the receptor on the cell surface, cells were incubated with 10 nM fNleLFN leYK-FITC on ice for 10 min and analyzed by flow cytometry. B, The ΔA mutant, which lacks four of the 11 potential phosphorylation sites in the C terminus, internalizes. Cells were incubated in the presence of unlabeled fMLP at 37°C for the indicated times, washed to remove uninternalized peptide, and labeled with 10 nM hexapeptide-FITC on ice for 10 min. The amount of receptor remaining on the cell surface was quantitated by flow cytometry. Inability of the FPR to bind arrestin restores degranulation to ΔST level. A, The RBL-ΔA cells become activated upon stimulation of the ΔA mutant receptor, but fail to activate arrestin. Cells were plated on glass coverslips overnight and fixed (0 min) or were stimulated in the presence of 10 nM fMLP for 20 min at 37°C and then fixed in 2% paraformaldehyde. The cells were permeabilized in 0.2% saponin, incubated with the rabbit anti-arrestin as the primary Ab, and then labeled with secondary Texas Red-conjugated goat anti-rabbit Ab. Cells were visualized by scanning confocal microscopy. B, Degranulation is terminated by receptor phosphorylation and not internalization. Degranulation levels of the RBL-ΔA mutant were compared with those of the RBL-ΔST and RBL-FPR forms of the FPR. RBL-FPR, RBL-ΔA, and RBL-ΔST cells were incubated in the presence of 100 nM fMLP for 30 min. Supernatants were assayed for the release of β-hexosaminidase. Degranulation values were normalized to IgE degranulation levels. The RBL-2H3 mast cell line has previously been used to characterize GPCR-mediated signaling events that culminate in degranulation (15, 16, 21). The regulation of this degranulation event in response to stimulation plays an important role in controlling the cytotoxic potential of leukocytes. Recent studies have provided contradictory conclusions regarding the role of receptor phosphorylation and arrestin binding in control of the degranulation response. While one study reported an absolute dependence of degranulation on arrestin binding (17), another reported no difference in the levels of degranulation between a phosphorylation-competent receptor and one that cannot be phosphorylated (13). In this study we examined RBL cell lines expressing various forms of the FPR to reveal the role of receptor phosphorylation and arrestin binding in regulating signaling from the FPR. We find that whereas the wild-type FPR is able to induce low levels of degranulation with kinetics consistent with receptor phosphorylation attenuating the response, the unphosphorylatable form of the FPR induces maximal degranulation limited only by the availability of granules. Furthermore, the level of degranulation correlated with the number of receptors expressed on the cell surface. To determine whether the constitutive presence of receptors on the cell surface or the lack of C-terminal phosphorylation after stimulation with fMLP contributed to the observed increase in degranulation, we used the partially phosphorylation-deficient ΔA mutant to demonstrate that a loss of receptors from the cell surface was insufficient to attenuate degranulation. Instead we show that phosphorylation of the C terminus and subsequent binding of arrestin in response to stimulation of FPR result in an attenuated degranulation response. Previous studies examining the degranulation response of stable RBL-FPR demonstrated ∼22.5% (16) release of β-hexosaminidase and little to no release of preloaded [3H]serotonin, (15). These RBL-2H3 cell lines used in these studies stably expressed between 90,000 and 200,000 receptors. The difference in the extent of degranulation between these studies and ours may have been due to a change in the degranulation potential over time. We have noticed that culturing RBL-2H3 cells for >8–10 passages results in a decrease in degranulation potential (C. Vines and E. Prossnitz, unpublished observations). To maintain consistency between our data sets, the stable cell lines were discarded from culture after 1 mo of propagation, and we normalized our degranulation values to levels that could be generated by stimulation of the IgE receptor. Our results are in contrast with those reported by Barlic et al. (17), which suggested that arrestin is a critical signaling component that is required to initiate degranulation in RBL-2H3 cells via the CXCR1 receptor. In this study stable transfectants of the CXCR1 receptor were used, and it was demonstrated that upon stimulation of the CXCR1 receptor, the Src family kinases Hck and Fgr are stimulated to bind to arrestin. This interaction was thought to induce the activation and translocation of these Src family members and their subsequent association with β-arrestin 1. Expression of a dominant-negative form of β-arrestin 1 (P91G-P121E), which expressed a mutated polyproline-rich SH3 domain binding region and was shown to be defective in binding to Src (6), inhibited degranulation of these cells. In addition, Barlic et al. (17) demonstrated that expression of a CXCR1 mutant that lacked all phosphorylation sites in the tail, 8STmCXCR1, failed to degranulate. It is important to note that internalization of CXCR1 is an arrestin-dependent event (12), while internalization of the FPR is not (10). That arrestin has a different role in the internalization of CXCR1 than it does in the internalization of the FPR may indicate that arrestin has a unique function in response to activation by either the FPR or the CXCR1. Recent studies with the C3a receptor have found that a lack of phosphorylatable serines or threonines in the C-terminal region (ΔST-C3a) had no effect on the ability of transiently transfected RBL-2H3 cells to degranulate, as measured by the release of β-hexosaminidase (13). Like the FPR, even in the absence of a phosphorylatable C terminus, the C3a receptor could still induce ERK activation (10). Interestingly, while the inability to phosphorylate the C terminus did not positively or negatively affect the extent of C3a-mediated degranulation in RBL-2H3 cells, it did affect the production of MCP-1 in these cells. The former result could be a result of the very high levels of receptor expression per cell in transiently transfected cells. These authors conclude that the ability to terminate degranulation was requiredfor the production of MCP-1. They raise the possibility that Src family kinases may be involved in the C3a-mediated degranulation process, since MCP-1 production was substantially inhibited in the presence of a Src family kinase inhibitor. Experiments to examine the role of Src family kinases in the FPR-mediated degranulation of RBL-2H3 cells are currently underway (C. M. Vines et al., manuscript in preparation). In summary, we have found that lack of phosphorylation of the C-terminal domain and the commensurate lack of arrestin binding to the FPR do not adversely affect the initiation and propagation of degranulation. On the contrary, only in the absence of receptor phosphorylation is a significant level of degranulation observed, with the extent of FPR-mediated degranulation being dependent upon the number of active receptors on the cell surface. While RBL cells have been used as a model in this study, these cells may not accurately reflect the signaling events that take place in primary cells. Indeed, fMLP has been shown to be a strong degranulating agent in neutrophils. Therefore, the signaling pathways involved in the degranulation of these primary cells could be different (22, 23). This does not preclude the observation that in the case of wild-type FPR, receptor phosphorylation severely curtails the degranulation response. Thus, phosphorylation of the FPR yields a novel mechanism of regulation of degranulation not previously observed for other GPCRs. We thank Dr. Bridget Wilson for helpful discussions and technical assistance. ↵1 This work was supported by National Institutes of Health Grants R01AI36357 and R01AI43932. ↵3 Abbreviations used in this paper: FPR, formyl peptide receptor; GFP, green fluorescent protein; GPCR, G protein-coupled receptor; MCP-1, monocyte chemoattractant protein 1.